I make no bones about the fact that I love carbs, especially potatoes in pretty much any form. With St. Patrick's Day just a few days away, I figured why not indulge in some potato goodness with an Irish twist. I love the fact that the Irish have a plethora of potato recipes. You can’t really go wrong with any of them. 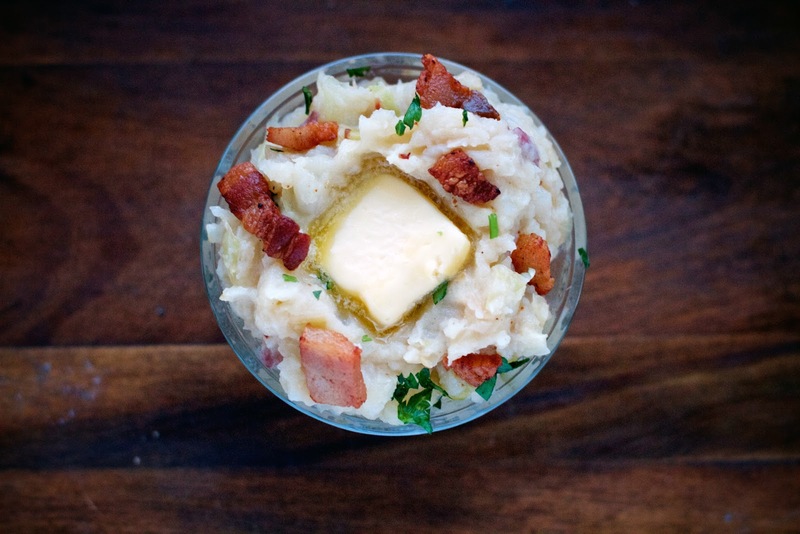 One of my new favorites is Colcannon, a mixture of mashed potatoes and cabbage. 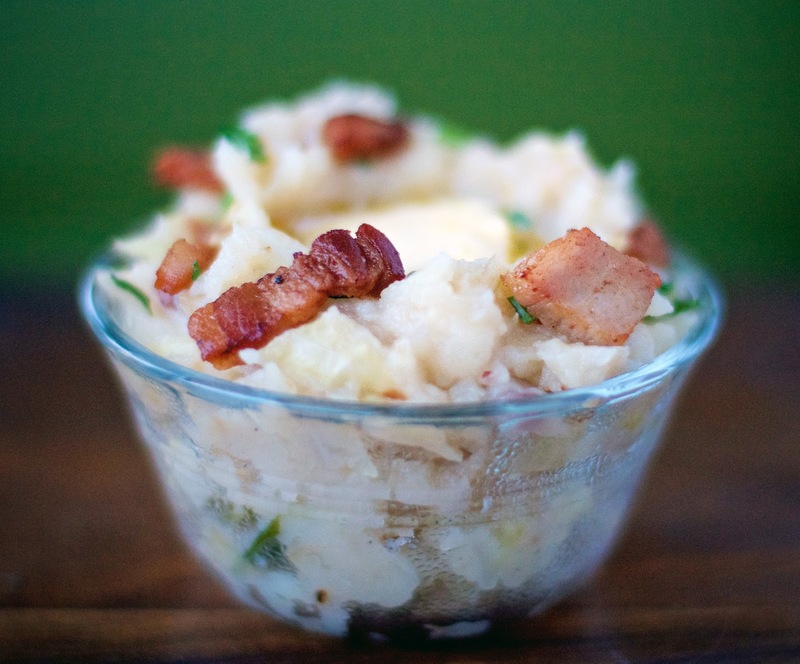 The name Colcannon is from a Gaelic word that translates as white-headed cabbage. The recipe has humble origins as a peasant dish. And, there are regional variations that swap kale in for the cabbage, or that combine potato and parsnip. I kept things fairly straightforward in my version with potatoes, cabbage, and a touch of bacon. It’s a hearty, comforting side dish that pairs perfectly with a roast. Now from what I understand, it's technically a dish served more in the Fall around Halloween, as opposed to in March, but it's still an iconic dish of Ireland and St. Patrick’s Day seems like the perfect chance to enjoy it. Quarter the potatoes and place in a large pot with water. Place on stove over medium-high heat. Bring to a boil. Cool until the potatoes are fork tender. Remove from heat. Drain and set aside. While the potatoes cook, in a large sauté pan cook the diced bacon. Scoop out the pieces, keeping the fat in the pan. Add two tablespoons of butter to the bacon fat and add the onion. Saute until translucent. Add in the chopped cabbage. Cook until very tender, about 20 minutes. Remove pan from heat. Add in the cooked potatoes, nutmeg, and milk. Mash until the potatoes are smooth and the cabbage and onions well combined with the potatoes. Serve immediately. For each portion, Scoop into individual portions. Make a well in the center of each and place in a pat of butter. Sprinkle with some of the bacon pieces and fresh parsley. I hear ya on the carbs! Being Irish I grew up on meat & potatoes. I learned about this from my office mate today! Then I saw your post. Now I'm curious about it! Sounds yummy! And I hear you on the potato goodness!